Drug-eluting stents (DES) have revolutionized interventional cardiology practice since receiving their CE mark in 2002 and US FDA approval in 2003. Their advantage over bare-metal stents (BMS) lies primarily in reducing repeat target vessel revascularization (TVR) [1,2]. When performed in a timely fashion, stenting during primary percutaneous coronary intervention (PCI) for ST-segment elevation myocardial infarction (STEMI) is considered the gold-standard for myocardial revascularization, delivering a reduction in TVR when compared with balloon angioplasty [3–5]. Nevertheless, the implantation of a drug and polymer combination in the presence of a thrombogenic milieu raised concerns regarding stent thrombosis. This potential risk is further compounded by the longer duration of dual antiplatelet therapy (DAPT) necessitating increased patient vigilance and compliance in those implanted with DES, and a lack of knowledge about the patients’ medical history in the setting of an emergency procedure. Stent choice in STEMI (appropriate for the individual), together with compliance to antiplatelet and other secondary prevention medication, are critical for optimizing patient outcomes following STEMI. This review examines the relevant literature and analyzes the safety and efficacy of implanting DES in patients with STEMI. DES have evolved from a thick-strut stainless steel skeleton, mounting a durable polymer controlling drug release, to a modern-day biodegradable polymer assembled upon a flexible thin-strut (stainless steel or alloy combination) frame. While many immunosuppressive and antiproliferative drugs have been investigated as potential antirestenotic agents, only a few have demonstrated clinical benefit in reducing restenosis. These agents include limus analogues and paclitaxel. Limus analogues are widely used, as they restrict cell-cycle progression, from G1 to S phase, within smooth muscle cells [6,7]. Paclitaxel inhibits cell division, in G0/G1 and G2/M phases, due to microtubule stabilization. The first generation of DES (sirolimus-eluting stents [SES] and paclitaxel-eluting stents [PES]) were effective in numerous coronary lesions . Limus analogues were preferred over paclitaxel, as they demonstrated greater efficacy in reducing neointimal growth, and reduced repeat revascularization rates [8,9]. Restenosis and very late stent thrombosis (VLST) remained troublesome, and DES were upgraded in an attempt to overcome this [8,10–13]. The second generation of DES, deploying zotarolimus and everolimus, were constructed from cobalt–chromium and incorporated thinner struts (80–90 μm), improving re-endothelialization and reducing the neointimal response [14,15]. The second generation of DES produced lower rates of repeat revascularization and less late and VLST in stable coronary artery disease, compared with first-generation DES . Furthermore, the latest generation of biodegradable polymer-based DES appear to increase safety by avoiding chronic inflammatory stimulus and promoting vascular healing, seen on optical coherence tomography (OCT) [17,18]. The presence of high rates of TVR following BMS implantation during STEMI led to the use of DES in this population, based on the success seen within low-risk populations. Two years following the introduction of DES, 80% of all non-STEMI patients within the Can Rapid Risk Stratification of Unstable Angina Patients Suppress Adverse Outcomes With Early Implementation of the ACC/AHA Guidelines (CRUSADE) registry received DES . Data on DES use within STEMI came from a retrospective analysis of the Rapamycin-Eluting Stent Evaluated At Rotterdam (RESEARCH) registry. Lemos et al. compared 186 consecutive patients with acute myocardial infarction (AMI) receiving SES with those receiving BMS, demonstrating safety and efficacy at 30 days with similar post-procedure vessel patency and enzymatic release, and incidence of death, reinfarction or repeat revascularization (SES: 7.5% vs BMS: 10.4%; p = 0.4). None of the patients receiving SES experienced stent thrombosis, and it occurred in 1.6% of patients treated with BMS (p = 0.1). There was a significant reduction in TVR at 300 days (1.1 vs 8.2%; p < 0.01), with no differences in death or re-infarction . Overall, at 300 days, the composite of death, re-infarction or TVR was in favor of SES implantation (9.4 vs 17%; HR: 0.52, 95% CI: 0.30–0.92; p = 0.02) . The first randomized controlled trial (RCT) to investigate the efficacy and safety of SES compared with BMS was the STRATEGY trial, conducted in 175 STEMI patients . The prospective, single-blinded RCT demonstrated at 2 years follow-up that the cumulative incidence of death, re-infarction or TVR was significantly lower within the SES arm compared with the BMS arm (24.2 vs 38.6%; p = 0.038) . This effect was largely driven by reductions in TVR (9.8 vs 25.5%; p = 0.01), with no difference in the composite of death and re-infarction (16.1 vs 20.5%; p = 0.43). Despite the cumulative incidence of death, re-infarction or TVR becoming nonsignificant at 5 years (29.9 vs 43.2%; HR: 0.63 [95% CI: 0.39–1.03]; p = 0.067), a major effect was still observed for TVR (10.3 vs 26.1%; HR: 0.37 [95% CI: 0.17–0.79]; p = 0.007) . Further RCTs were performed to evaluate SES compared with BMS in STEMI and, overall, at 12 months reported significantly lower rates of TVR as displayed in Table 1 [24–29]. The most significant reductions in TVR (SES: 5.6% vs BMS: 13.4%, p < 0.001 at 1 year) was detected in the TYPHOON trial . Likewise in the MULTISTRATEGY trial, the TVR was 3.2% (SES) versus 10.2% (BMS) (p < 0.001) at 8 months . Overall, the rate of revascularization remained consistently lower within the SES arm of RCTs, up to 5 years of follow-up, as displayed in Table 1 [30–34]. Furthermore, several RCTs incorporating angiographic follow-up confirmed SES to display less late luminal loss [24,25,29]. In summary, the benefit of SES in the setting of STEMI was largely driven by reductions in TVR. Table 1. 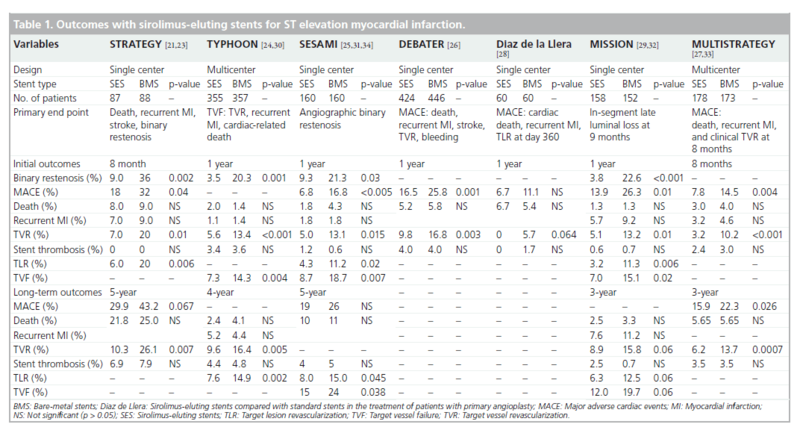 Outcomes with sirolimus-eluting stents for ST elevation myocardial infarction. One of the first reports on PES was the Taxus- Stent Evaluated at Rotterdam Cardiology Hospital (T-SEARCH) registry, consisting of 162 consecutive STEMI patients receiving PES. This registry was conducted in association with the RESEARCH registry and patients were followed up for 6 years . PES did not show any superiority over BMS and surprisingly, TVR rates showed no difference between groups . Studies utilizing PES in STEMI are displayed in Table 2 [36–42]. In the PASSION trial, 619 STEMI patients were randomized to receive either a PES or BMS, with a composite primary end point of cardiac death, re-infarction or target lesion revascularization (TLR) at 1 year demonstrating no differences between groups (8.8 vs 12.8%; p = 0.09) . This was attributed to unexpected low event rates within the BMS group. Although not statistically significant, the PES group experienced an increase in reinfarction (6.8 vs 4.3%; p = 0.21) and definite stent thrombosis (3.9 vs 1.7%; p = 0.14) as compared with the BMS arm at 5-year follow-up . Table 2. Outcomes with paclitaxel-eluting stents for ST elevation myocardial infarction. Until the HORIZONS-AMI trial, all previous RCTs investigating first-generation DES were modest in size (175–712 patients) and generated comparable results, suggesting a reduction in TLR or TVR with no significant differences in death, re-infarction or stent thrombosis at 3–5 years follow-up (Tables 1 & 2). HORIZONSAMI enrolled 3006 STEMI patients in a 2 × 2 factorial design to compare the use of bivalirudin versus unfractionated heparin plus abciximab and PES versus BMS . Baseline characteristics of the cohort were similar, with participants receiving DAPT for a minimum of 6 months. The primary efficacy end point, ischemia-driven TLR, demonstrated superiority within the PES arm at 12 months (4.5 vs 7.5%; p = 0.002), which was sustained to 3 years (9.4 vs 15.1%; p < 0.0001) [37,38]. There were also no significant differences in death, re-infarction or stent thrombosis, confirming the safety of PES in the setting of STEMI . Brar et al. conducted a meta-analysis of 13 RCTs (n = 7352) including the HORIZONS-AMI trial and 18 registries (n = 26,521), with mean follow-up ranging between 3 months and 36 months . Compared with BMS, DES reduced TVR (RR: 0.44, 95% CI: 0.35–0.55 from randomized trials; RR: 0.54, 95% CI: 0.40–0.74 from registries) without increasing the risk of death, re-infarction or stent thrombosis. More recently, a pooled patient-level meta-analysis of 6298 patients from 11 RCTs replicated previous meta-analysis findings, demonstrating a significant reduction in the incidence of TVR with DES (12.7 vs 20.1%; HR: 0.57, 95% CI: 0.50–0.66; p < 0.001) with no associated increase in mortality, stent thrombosis or reinfarction at long-term follow-up (mean 1201 [standard deviation: 440] days) . However, this study revealed a significant increased risk of VLST (HR: 2.81 [95% CI: 1.28–6.19]; p = 0.04) and re-infarction (HR: 2.06 [95% CI: 1.22–3.49]; p = 0.03) within the DES group after 2 years from the beginning of the study . The Massachusetts registry was the first study to demonstrate significant benefit with the use of DES versus BMS in a real-world myocardial infarction (MI) population, with a reduction in risk-adjusted mortality rates at 2 years among all patients with MI (10.7 vs 12.8%; p = 0.02), STEMI (8.5 vs 11.6%; p = 0.008), and MI without ST-segment elevation (12.8 vs 15.6%; p = 0.04) . In contrast to the Massachusetts registry, an analysis of the multinational Global Registry of Acute Coronary Syndrome Events (GRACE) database consisting of 5093 STEMI patients (17%), of whom 26% received DES, demonstrated an increase in adjusted mortality rates among patients receiving DES from 6 months to 2 years (HR: 4.90; 95% CI: 1.42–16.9; p = 0.01), or from 1 year to 2 years (HR: .06; 95% CI: 1.36–36.6; p = 0.02), respectively. There were no significant differences in adjusted mortality up to 6 months or 1 year following discharge. The results obtained from an observational and nonrandomized data set should be interpreted with caution, especially in the presence of significant differences in risk factors of late disease progression between BMS and DES groups. Nevertheless, the increased late mortality observed with DES may reflect suboptimal compliance with DAPT that is not apparent from clinical trials . Detailed analysis of each of the registry studies utilizing DES in the setting of STEMI is beyond the scope of this manuscript. Within the second generation of DES, there are two main antiproliferative drugs that are released: everolimus (EES) and zotarolimus (ZES). The earlier ZES (Endeavor®) was inferior to SES in the all-comer SORTOUT III trial, with a higher occurrence of the primary end point (composite of cardiac death, MI and TLR) in the ZES group at 9 months (6 vs 3%; HR: 2.15, 95% CI: 1.43–3.23; p = 0.0002) . However, the study population only comprised 170 (7%) STEMI cases. The ZEST-AMI trial randomized 328 STEMI patients and demonstrated no significant differences between groups for the composite of death, re-infarction or revascularization at 1 year (ZES: 11.3% vs SES: 8.2% vs PES: 8.2%; p = 0.834), although in-segment late loss and restenosis rates were lowest in the SES group compared with ZES and PES groups . This was replicated in the KOMER RCT consisting of 611 patients (randomized 1:1:1 for ZES:PES:SES), demonstrating no significant differences between groups for the composite primary end point of cardiac death, re-infarction or TLR at 12 and 18 months . In the OCTAMI study, no significant differences were observed between BMS and Endeavor ZES for the primary end point of strut coverage at 6 months and at 1 year studied using OCT . The newer ZES (Endeavor Resolute) improves on its predecessor by providing a longer elution period (180 days vs 14 days). To our knowledge, there are no published randomized trials on the efficacy and safety of Endeavor Resolute in STEMI. However, the all-comers RESOLUTE III trial demonstrated noninferiority for the newer ZES versus EES (composite of cardiac death, MI and TLR: 8.2 vs 8.3%; p < 0.001 for noninferiority), although the proportion of MI was only 34% with no information given on the relative proportions of STEMI and non-STEMI cases . By contrast, a post hoc subgroup analysis of the all-comer COMPARE trial demonstrated that EES was superior to PES within STEMI (n = 452) and non-STEMI (n = 411) subgroups . EES was shown to significantly reduce the composite of all-cause mortality, re-infarction and TVR at 2 years (RR: 0.57, 95% CI: 0.40–0.83; p = 0.002), most significantly in the STEMI group (RR: 0.51, 95% CI: 0.30–0.87; p = 0.01). The rates of stent thrombosis were also lower with EES (RR: 0.30, 95% CI: 0.12–0.73; p = 0.005) . In the subsequent all-comer EXAMINATION trial consisting of 1498 randomized patients (70% of all presenting STEMI cases), the primary end point (composite of all-cause death, MI and revascularization) was similar at 1‑year clinical follow-up for BMS and EES groups (14.4 and 12.0%; p = 0.16), but EES showed better performance with lower rates of TVR (3.9 vs 7%; p = 0.007) and definite stent thrombosis (0.5 vs 1.9%; p = 0.01) . The recently published XAMI trial, which included 600 (96%) STEMI patients, confirmed the efficacy and safety of EES over SES with significantly lower major adverse cardiac events (MACE; 4.0 vs 7.7%; p = 0.048), and no difference in definite and/or probable stent thrombosis rates (1.2 vs 2.7%; p = 0.21) at 1 year . The latest generation of DES are designed to overcome chronic inflammatory reactions and neoatherosclerosis thought to be associated with the durable polymer coating [56,57]. Use of biodegradable polymer biolimus-eluting stents (BES) was designed to leave a polymer-free, bare metal scaffold following drug elution. This approach was postulated to improve arterial healing, attenuate inflammation and therefore deliver superior clinical outcomes compared with earlier DES. Indeed, meta-analysis and data derived from a large RCT (LEADERS) has comprehensively demonstrated the safety and efficacy of biodegradable DES in coronary artery disease [58,59]. Pooled analysis from 4-year follow-up data derived from the ISARTEST 3, ISAR-TEST 4 and LEADERS trials demonstrated significantly less stent thrombosis with biodegradable polymer (HR: 0.56, 95% CI: 0.35–0.90: p = 0.015), driven by reduced rates of VLST (HR: 0.56, 95% CI: 0.35–0.90; p = 0.015) and less re-infarction in the biodegradable polymer arm (HR: 0.59, 95% CI: 0.73–0.95; p = 0.031) . When specif ically considering STEMI patients receiving either a BES or SES within the LEADERS and ISAR-TEST 4 trials, at 4 years, there was a trend towards lower rates of MACE within the BES arm (HR: 0.54; 95% CI: 0.29–1.01, p = 0.055); driven by lower rates of TLR (HR: 0.51; 95% CI: 0.23–0.94, p = 0.03). No differences between durable polymer SES and BES were noted for cardiac death (HR: 0.56; 95% CI: 0.17– 1.86, p = 0.34), re-infarction (HR: 0.62; 95% CI: 0.20–1.95, p = 0.42) or definite stent thrombosis (HR: 0.54; 95% CI: 0.20–1.46, p = 0.22) at 4 years . The prospective, multinational COMFORTABLE AMI trial randomized 1161 STEMI patients to receive a BES or a BMS. At 1 year, the primary end point of MACE (defined as the composite of death, target-vessel related MI, or ischemia-driven TLR within 12 months) was significantly lower in the BES group (4.3 vs 8.7%; p = 0.004), which was largely driven by reductions in TLR (1.6 vs 5.7%; p < 0.001). COMFORTABLE AMI was the first trial to demonstrate a significant safety benefit for BES over BMS, with reduced target vessel re-infarction, due to stent thrombosis or restenosis (0.5 vs 2.7%; p = 0.01). Overall, 90% of the BES arm and 88.1% of the BMS arm were receiving DAPT at 1 year (p = 0.30). Interestingly, stent thrombosis rates at 1 year, although not statistically significant, were twice as large within the BMS group (BMS: 2.1 vs BES: 0.9%; p = 0.10) . Despite reductions in repeat revascularization and lower rates of restenosis, observational studies suggested that first-generation DES contributed towards higher rates of VLST [35,62,63] (an example is displayed in Figure 1). Stent thrombosis occurs more frequently in STEMI, and DAPT is essential in reducing its occurrence [64–66]. Although observational studies largely based on first-generation DES demonstrated a significant increased risk of VLST (>2 years) associated with DES, a meta-analysis by Suh et al. assessing 12 RCTs and 24 observational studies demonstrated that there were no significant differences between BMS or DES for stent thrombosis at 2 years of follow-up . Figure 1. Very late stent thrombosis with first-generation drug-eluting stents. An example of very late stent thrombosis (arrows) is shown above (A & B). The patient presented with ST elevation myocardial infarction and ventricular fibrillation arrest 2 years after previous percutaneous coronary intervention to his left anterior descending artery. (C) Coronary angiography revealed stent thrombosis. Intravascular ultrasound showed evidence of stent malapposition (arrow). (D) The patient was successfully treated with thrombus aspiration, pharmacotherapy and balloon dilatation of the malapposed stents (arrow) with good result on angiography and on intravascular ultrasound. It is known that high thrombus burden, stent under-expansion and vessel calcification contribute to a higher prevalence of stent thrombosis for both DES and BMS. However, data inferred from autopsy and intracoronary imaging suggests an altered vascular response, with delayed endothelialization existing for DES in comparison to BMS [56,68,69]. Neointimal suppression, persistent fibrin deposition or reduced cellular coverage of stent struts, contributing to increased late stent thrombosis, have all been implicated as possible causes following DES implantation . Additionally, the high thrombus burden present in STEMI may compromise the distribution of antiproliferative agents eluted from the DES, disrupting vascular healing. An analysis from the HORIZONS AMI study demonstrated no difference in the 2‑year cumulative rates of stent thrombosis between DES and BMS (p = 0.98) . However, the EXAMINATION trial, investigating EES, although not powered to investigate stent thrombosis, demonstrated that polymer-coated stents demonstrated lower rates of thrombogenicity as evidenced by the low rates of Academic Research Consortium (ARC)-defined definite stent thrombosis (EES: 0.5% vs BMS: 1.9%, p = 0.01) and ARC-defined definite/probable stent thrombosis (EES: 0.9% vs BMS: 2.6%, p = 0.01) . Another trial demonstrated EES to significantly reduce stent thrombosis compared with PES (RR: 0.30; 95% CI: 0.12–0.73; p = 0.005) . The PROTECT study evaluating 8800 STEMI patients receiving either ZES or SES demonstrated no evidence of superiority of E-ZES compared with C-SES in definite or probable stent thrombosis rates at 3 years [71,72]. Intravascular ultrasound (IVUS) and OCT reveal that late acquired strut malapposition (LASM) is more prevalent in patients following DES implantation in STEMI [68,69,73,74] (an example is displayed in Figures 2 & 3). More recently, an IVUS sub-analysis from the SIRTAX trial demonstrated that patients with LASM experienced higher rates of MI and VLST during 5 year follow-up compared with patients without LASM (MI: 13.5 vs 1.9%; HR: 7.53; 95% CI: 1.79–31.6, p = 0.001 and ARC-definite VLST: 13.5% vs 0.6%; HR: 23.2; 95% CI: 2.65–203, p < 0.001) . In another study, the presence of incomplete stent apposition as assessed by IVUS 8 months following DES implantation was associated with a higher rate of MI (HR:7.53; 95% CI: 1.79–31.6, p = 0.001) and very late stent thrombosis (HR: 23.2; 95% CI: 2.65–203, p < 0.001) during long-term follow-up . A previous study evaluating the benefit of IVUS during primary PCI demonstrated no significant difference in the occurrence of allcause mortality at 12 months between those that underwent primary PCI with and without IVUS guidance (HR: 0.212; 95% CI: 0.026–1.73; p = 0.148) . It appears that self-expanding stents will have an important role to prevent stent undersizing and stent malapposition – both risk factors for stent thrombosis in STEMI. In the APPOSITION I study, IVUS at 3 days showed that the STENTYS® self-expanding stents expanded in concordance with the epicardial vasodilatation, which can represent a 19% increase of vessel area. The APPOSITION II randomized trial (n = 80) demonstrated that the STENTYS BMS eliminated malapposition, while 28% of balloonexpandable stents are malapposed as assessed by OCT at 3 days . Whether the properties of the STENTYS can translate into clinical benefits will be explored by the APPOSITION III trial. Figure 2. 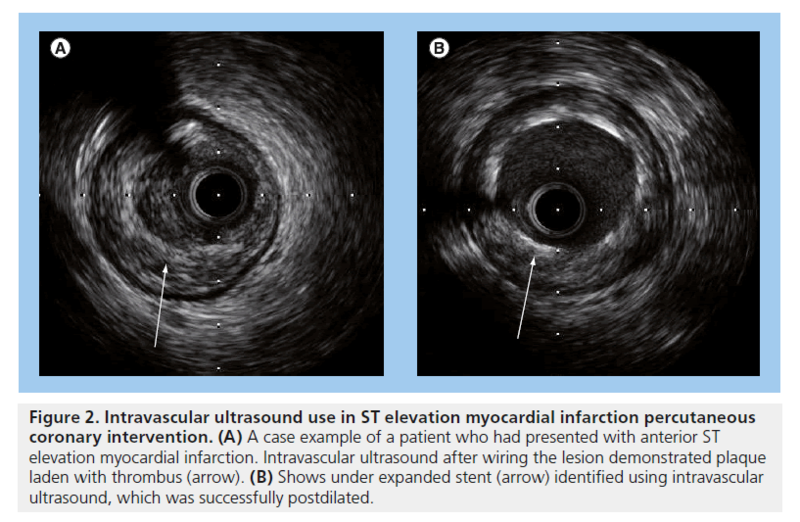 Intravascular ultrasound use in ST elevation myocardial infarction percutaneous coronary intervention. (A) A case example of a patient who had presented with anterior ST elevation myocardial infarction. Intravascular ultrasound after wiring the lesion demonstrated plaque laden with thrombus (arrow). (B) Shows under expanded stent (arrow) identified using intravascular ultrasound, which was successfully postdilated. Figure 3. 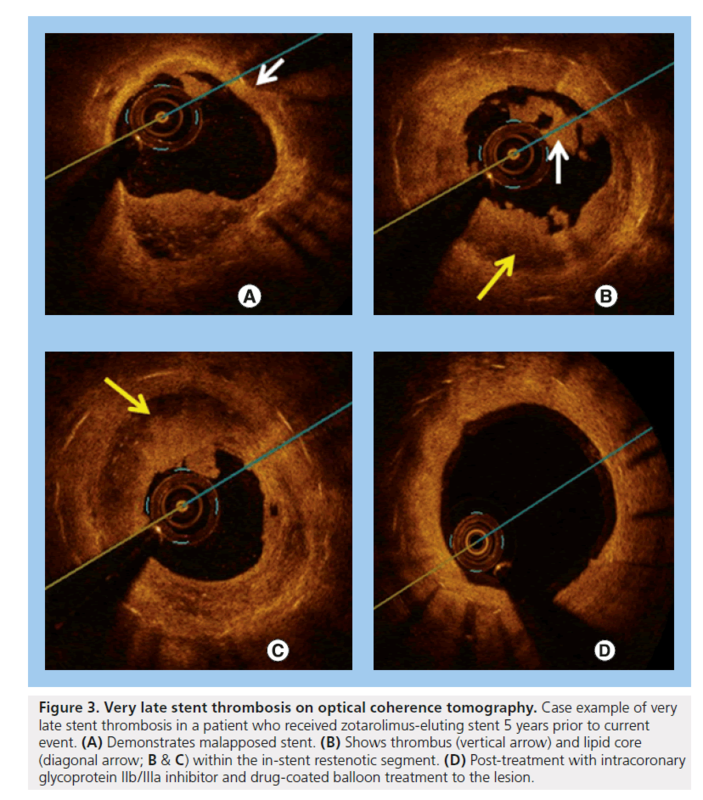 Very late stent thrombosis on optical coherence tomography. Case example of very late stent thrombosis in a patient who received zotarolimus-eluting stent 5 years prior to current event. (A) Demonstrates malapposed stent. (B) Shows thrombus (vertical arrow) and lipid core (diagonal arrow; B & C) within the in-stent restenotic segment. (D) Post-treatment with intracoronary glycoprotein IIb/IIIa inhibitor and drug-coated balloon treatment to the lesion. DES have improved outcomes in the care of STEMI patients, delivering a significant reduction in repeat revascularization with no increased risk of death or repeat infarction. As our understanding of the mechanisms underlying stent thrombosis has evolved, so too has the design of DES, resulting in better outcomes for patients. A large evidence base now supports the use of DES in a majority of patients undergoing PCI. However, potential compliance issues with DAPT must be assessed prior to implantation. More potent antiplatelet agents such as ticagrelor and prasugrel in the STEMI setting have demonstrated further reductions in stent thrombosis events, making DES the stents of choice in this setting. Studies evaluating shorter duration of DAPT following DES implantation are ongoing and will provide information on whether shorter duration of potent DAPT will result in similar cardiovascular outcomes but with reduced bleeding. Finally, the exciting technology of bioabsorbable polymer may help tackle VLST following stent deployment, although their superiority on the reduction of TVR and stent thrombosis over current DES in high-risk patients has not been proven by randomized trials, and their cost will likely remain a serious limitation to their use in practice. It is evident that evolution of DES has improved outcomes for STEMI patients. However, given the role of procedure-related (malapposition, lateloss) and patient characteristics (dysfunctional vasomotion, polymer hypersensitivity, diabetes mellitus and compliance), it is unlikely that the incidence of stent thrombosis will be abolished altogether. The development of biodegradable stents raises the hope that following stent dissolution, the incidence of late and VLST may be reduced to an insignificant level. Utilization of biodegradable polymer stents in the setting of STEMI has demonstrated reduced incidence of VLST. More recently, the EVOLVE study (a prospective randomized multicenter singleblind trial for the treatment of a de novo atherosclerotic lesion) revealed a favorable in-stent late loss for a bioabsorbable compared with a durable polymer on a platinum– chromium stent eluting everolimus . Biodegradable stents offer another alternative option. Following degradation, the patent vessel would promote endothelial nitric oxide synthase and nitric oxide production, which could potentially reduce neoatherosclerosis and stent thrombosis events. Managing STEMI patients involves selecting appropriate adjunctive pharmacological agents. Given the reduced risk of VLST with biodegradable polymer-coated stents, utilization of potent antiplatelet agents, including ticagrelor and prasugrel, may further attenuate VLST within STEMI patients [17,66,80–82]. Similarly, peri-procedural antithrombin agents may contribute towards reduction in the rate of VLST. A landmark analysis of HORIZONS-AMI data suggested bivalirudin monotherapy was superior to heparin and a glycoprotein IIb/IIIa inhibitor in reducing the rate of definite/probable VLST (HR: 0.64 [95% CI: 0.44–0.94]; p = 0.02), despite an increased rate of early definite/probable stent thrombosis (HR: 5.74 [95% CI: 1.98–16.6]; p < 0.001) . In summary, significant improvements to DES and adjunctive pharmacotherapy have demonstrated reduction in stent thrombosis following STEMI. The use of DES in the STEMI setting is supported by clinical evidence, and further iterations of both DES and adjunctive pharmacotherapy may yield further improvements in clinical outcomes. ▪ Drug-eluting stents have evolved from sirolimus- and paclitaxel-eluting stents to second-generation zotarolimus and everolimus stents with proven reduction in repeat revascularization compared withbare-metal stents, but stent thrombosis remains a concern. A biodegradable polymer design could improve the safety profile of drug-eluting stents. ▪ First-generation drug-eluting stents are associated with significant reductions in target vessel or lesion revascularization compared with bare-metal stents. ▪ Randomized trials have highlighted the improved efficacy and safety of the everolimus-eluting stents compared with first-generation stents. reinfarction due to stent thrombosis or restenosis, and are associated with reduced rates of stent thrombosis compared with bare-metal stents. ▪ Studies so far have not demonstrated any mortality benefit with the routine use of intravascular ultrasound during primary percutaneous coronary intervention. Garg S, Serruys PW. Coronary stents: current status. J. Am. Coll. Cardiol. 56(Suppl. 10), S1–S42 (2010). Garg S, Serruys PW. Coronary stents: looking forward. J. Am. Coll. Cardiol. 56(Suppl. 10), S43–S78 (2010). Nordmann AJ, Bucher H, Hengstler P, Harr T, Young J. Primary stenting versus primary balloon angioplasty for treating acute myocardial infarction. Cochrane Database Syst. Rev. (2), CD005313 (2005). Levine GN, Bates ER, Blankenship JC et al. 2011 ACCF/AHA/SCAI guideline for percutaneous coronary intervention: executive summary: a report of the American College of Cardiology Foundation/American Heart Association Task Force on Practice Guidelines and the Society for Cardiovascular Angiography and Interventions. Circulation 124(23), 2574–2609 (2011). Wijns W, Kolh P, Danchin N et al. Guidelines on myocardial revascularization. Eur. Heart J. 31(20), 2501–2555 (2010). Marx SO, Marks AR. Bench to bedside: the development of rapamycin and its application to stent restenosis. Circulation 104(8), 852–855 (2001). Gingras AC, Raught B, Sonenberg N. mTOR signaling to translation. Curr. Top Microbiol. Immunol. 279, 169–197 (2004). Stettler C, Wandel S, Allemann S et al. Outcomes associated with drug-eluting and bare-metal stents: a collaborative network meta-analysis. Lancet 370(9591), 937–948 (2007). Schomig A, Dibra A, Windecker S et al. A meta-analysis of 16 randomized trials of sirolimus-eluting stents versus paclitaxeleluting stents in patients with coronary artery disease. J. Am. Coll. Cardiol. 50(14), 1373–1380 (2007). Stone GW, Moses JW, Ellis SG et al. Safety and efficacy of sirolimus- and paclitaxeleluting coronary stents. N. Engl. J. Med. 356(10), 998–1008 (2007). Spaulding C, Daemen J, Boersma E, Cutlip DE, Serruys PW. A pooled analysis of data comparing sirolimus-eluting stents with bare-metal stents. N. Engl. J. Med. 356(10), 989–997 (2007). Kastrati A, Mehilli J, Pache J et al. Analysis of 14 trials comparing sirolimus-eluting stents with bare-metal stents. N. Engl. J. Med. 356(10), 1030–1039 (2007). Mauri L, Hsieh WH, Massaro JM, Ho KK, D’Agostino R, Cutlip DE. Stent thrombosis in randomized clinical trials of drug-eluting stents. N. Engl. J. Med. 356(10), 1020–1029 (2007). Joner M, Nakazawa G, Finn AV et al. Endothelial cell recovery between comparator polymer-based drug-eluting stents. J. Am. Coll. Cardiol. 52(5), 333–342 (2008). Chen YW, Smith ML, Sheets M et al. Zotarolimus, a novel sirolimus analogue with potent anti-proliferative activity on coronary smooth muscle cells and reduced potential for systemic immunosuppression. J. Cardiovasc. Pharmacol. 49(4), 228–235 (2007). Bangalore S, Kumar S, Fusaro M et al. Short and long-term outcomes with drug eluting and bare metal coronary stents: a mixed treatment comparison analysis of 117 762 patient-years of follow-up from randomized trials. Circulation 125(23), 2873–2891 (2012). Stefanini GG, Byrne RA, Serruys PW et al. Biodegradable polymer drug-eluting stents reduce the risk of stent thrombosis at 4 years in patients undergoing percutaneous coronary intervention: a pooled analysis of individual patient data from the ISAR-TEST 3, ISAR-TEST 4, and LEADERS randomized trials. Eur. Heart J. 33(10), 1214–1222 (2012). ▪ Study demonstrates benefit of biodegradable polymer-based drug-eluting stents in reducing very late stent thrombosis. Barlis P, Regar E, Serruys PW et al. An optical coherence tomography study of a biodegradable vs. durable polymer-coated limus-eluting stent: a LEADERS trial substudy. Eur. Heart J. 31(2), 165–176 (2010). Kandzari DE, Roe MT, Ohman EM et al. Frequency, predictors, and outcomes of drugeluting stent utilization in patients with highrisk non-ST-segment elevation acute coronary syndromes. Am. J. Cardiol. 96(6), 750–755 (2005). Lemos PA, Saia F, Hofma SH et al. Short- and long-term clinical benefit of sirolimus-eluting stents compared with conventional bare stents for patients with acute myocardial infarction. J. Am. Coll. Cardiol. 43(4), 704–708 (2004). Valgimigli M, Percoco G, Malagutti P et al. Tirofiban and sirolimus-eluting stent vs abciximab and bare-metal stent for acute myocardial infarction: a randomized trial. JAMA 293(17), 2109–2117 (2005). Valgimigli M, Campo G, Arcozzi C et al. Twoyear clinical follow-up after sirolimus-eluting versus bare-metal stent implantation assisted by systematic glycoprotein IIb/IIIa Inhibitor Infusion in patients with myocardial infarction: results from the STRATEGY study. J. Am. Coll. Cardiol. 50(2), 138–145 (2007). Tebaldi M, Arcozzi C, Campo G, Percoco G, Ferrari R, Valgimigli M. The 5‑year clinical outcomes after a randomized comparison of sirolimus-eluting versus bare-metal stent implantation in patients with ST-segment elevation myocardial infarction. J. Am. Coll. Cardiol. 54(20), 1900–1901 (2009). Spaulding C, Henry P, Teiger E et al. Sirolimus-eluting versus uncoated stents in acute myocardial infarction. N. Engl. J. Med. 355(11), 1093–1104 (2006). ▪▪ One of the largest randomized trials demonstrating a reduction in target vessel revascularization with sirolimus-eluting versus bare-metal stents in ST elevation myocardial infarction. Menichelli M, Parma A, Pucci E et al. Randomized trial of sirolimus-eluting stent versus bare-metal stent in acute myocardial infarction (SESAMI). J. Am. Coll. Cardiol. 49(19), 1924–1930 (2007). Wijnbergen I, Helmes H, Tijssen J et al. Comparison of drug-eluting and bare-metal stents for primary percutaneous coronary intervention with or without abciximab in ST-segment elevation myocardial infarction: DEBATER: the Eindhoven reperfusion study. JACC Cardiovasc. Interv. 5(3), 313–322 (2012). Valgimigli M, Campo G, Percoco G et al. Comparison of angioplasty with infusion of tirofiban or abciximab and with implantation of sirolimus-eluting or uncoated stents for acute myocardial infarction: the MULTISTRATEGY randomized trial. JAMA 299(15), 1788–1799 (2008). Diaz de la Llera LS, Ballesteros S, Nevado J et al. Sirolimus-eluting stents compared with standard stents in the treatment of patients with primary angioplasty. Am. Heart J. 154(1), 164.e1–e6 (2007). van der Hoeven BL, Liem SS, Jukema JW et al. Sirolimus-eluting stents versus baremetal stents in patients with ST-segment elevation myocardial infarction: 9‑month angiographic and intravascular ultrasound results and 12‑month clinical outcome results from the MISSION! Intervention Study. J. Am. Coll. Cardiol. 51(6), 618–626 (2008). Spaulding C, Teiger E, Commeau P et al. Four-year follow-up of TYPHOON (trial to assess the use of the CYPHer sirolimus-eluting coronary stent in acute myocardial infarction treated with BallOON angioplasty). JACC Cardiovasc. Interv. 4(1), 14–23 (2011). Musto C, Fiorilli R, De Felice F et al. Longterm outcome of sirolimus-eluting vs baremetal stent in the setting of acute myocardial infarction: 5‑year results of the SESAMI trial. Int. J. Cardiol. doi:10.1016/j. ijcard.2011.10.117 (2011) (Epub ahead of print). Atary JZ, van der Hoeven BL, Liem SS et al. Three-year outcome of sirolimus-eluting versus bare-metal stents for the treatment of ST-segment elevation myocardial infarction (from the MISSION! Intervention Study). Am. J. Cardiol. 106(1), 4–12 (2010). Valgimigli M, Campo G, Gambetti S et al. Three-year follow-up of the MULTI center evaluation of single high-dose bolus TiRofiban versus abciximab with sirolimuseluting STEnt or bare-metal stent in acute myocardial infarction study (MULTISTRATEGY). Int. J. Cardiol. doi:10.1016/j.ijcard.2011.07.106 (2011) (Epub ahead of print). Violini R, Musto C, De Felice F et al. Maintenance of long-term clinical benefit with sirolimus-eluting stents in patients with ST-segment elevation myocardial infarction 3‑year results of the SESAMI (sirolimuseluting stent versus bare-metal stent in acute myocardial infarction) trial. J. Am. Coll. Cardiol. 55(8), 810–814 (2010). Simsek C, Magro M, Boersma E et al. Comparison of six-year clinical outcome of sirolimus- and paclitaxel-eluting stents to bare-metal stents in patients with ST-segment elevation myocardial infarction: an analysis of the RESEARCH (rapamycin-eluting stent evaluated at Rotterdam cardiology hospital) and T-SEARCH (taxus stent evaluated at Rotterdam cardiology hospital) registries. J. Invasive Cardiol. 23(8), 336–341 (2011). Vink MA, Dirksen MT, Suttorp MJ et al. 5‑year follow-up after primary percutaneous coronary intervention with a paclitaxel-eluting stent versus a bare-metal stent in acute STsegment elevation myocardial infarction: a follow-up study of the PASSION (paclitaxeleluting versus conventional stent in myocardial infarction with ST-segment elevation) trial. JACC Cardiovasc. Interv. 4(1), 24–29 (2011). Stone GW, Lansky AJ, Pocock SJ et al. Paclitaxel-eluting stents versus bare-metal stents in acute myocardial infarction. N. Engl. J. Med. 360(19), 1946–1959 (2009). Stone GW, Witzenbichler B, Guagliumi G et al. Heparin plus a glycoprotein IIb/IIIa inhibitor versus bivalirudin monotherapy and paclitaxel-eluting stents versus bare-metal stents in acute myocardial infarction (HORIZONS-AMI), final 3-year results from a multicenter, randomised controlled trial. Lancet 377(9784), 2193–2204 (2011). Dirksen MT, Vink MA, Suttorp MJ et al. Two year follow-up after primary PCI with a paclitaxel-eluting stent versus a bare-metal stent for acute ST-elevation myocardial infarction (the PASSION trial), a follow-up study. EuroIntervention 4(1), 64–70 (2008). Chechi T, Vittori G, Biondi Zoccai GG et al. Single-center randomized evaluation of paclitaxel-eluting versus conventional stent in acute myocardial infarction (SELECTION). J. Interv. Cardiol. 20(4), 282–291 (2007). Kim HS, Lee JH, Lee SW et al. Long-term safety and efficacy of sirolimus- vs. paclitaxel-eluting stent implantation for acute ST-elevation myocardial infarction: 3-year follow-up of the PROSIT trial. Int. J. Cardiol. 147(2), 253–257 (2011). Lee JH, Kim HS, Lee SW et al. Prospective randomized comparison of sirolimus- versus paclitaxel-eluting stents for the treatment of acute ST-elevation myocardial infarction: PROSIT trial. Catheter. Cardiovasc. Interv. 72(1), 25–32 (2008). Laarman GJ, Suttorp MJ, Dirksen MT et al. Paclitaxel-eluting versus uncoated stents in primary percutaneous coronary intervention. N. Engl. J. Med. 355(11), 1105–1113 (2006). Brar SS, Leon MB, Stone GW et al. Use of drug-eluting stents in acute myocardial infarction: a systematic review and metaanalysis. J. Am. Coll. Cardiol. 53(18), 1677–1689 (2009). De Luca G, Dirksen MT, Spaulding C et al. Drug-eluting vs bare-metal stents in primary angioplasty: a pooled patient-level meta-analysis of randomized trials. Arch. Intern. Med. 172(8), 611–621 (2012). Mauri L, Silbaugh TS, Garg P et al. Drugeluting or bare-metal stents for acute myocardial infarction. N. Engl. J. Med. 359(13), 1330–1342 (2008). ▪ One of the first registry studies to demonstrate mortality reduction in STsegment elevation myocardial infarction with the use of drug-eluting stents. Steg PG, Fox KA, Eagle KA et al. Mortality following placement of drug-eluting and baremetal stents for ST-segment elevation acute myocardial infarction in the Global Registry of acute coronary events. Eur. Heart J. 30(3), 321–329 (2009). ▪▪ Registry study showing increased mortality following drug-eluting stents implantation for ST-segment elevation myocardial infarction but findings were confounded by significant differences in risk factors for disease progression between the drug-eluting and bare-metal stent groups. Rasmussen K, Maeng M, Kaltoft A et al. Efficacy and safety of zotarolimus-eluting and sirolimus-eluting coronary stents in routine clinical care (SORT OUT III), a randomised controlled superiority trial. Lancet 375(9720), 1090–1099 (2010). Lee CW, Park DW, Lee SH et al. Comparison of the efficacy and safety of zotarolimus-, sirolimus-, and paclitaxeleluting stents in patients with ST-elevation myocardial infarction. Am. J. Cardiol. 104(10), 1370–1376 (2009). Kang WC, Ahn T, Lee K et al. Comparison of zotarolimus-eluting stents versus sirolimus-eluting stents versus paclitaxeleluting stents for primary percutaneous coronary intervention in patients with STelevation myocardial infarction: results from the Korean Multicenter Endeavor (KOMER) acute myocardial infarction (AMI) trial. EuroIntervention 7(8), 936–943 (2011). Guagliumi G, Sirbu V, Bezerra H et al. Strut coverage and vessel wall response to zotarolimus-eluting and bare-metal stents implanted in patients with ST-segment elevation myocardial infarction: the OCTAMI (Optical Coherence Tomography in Acute Myocardial Infarction) Study. JACC Cardiovasc. Interv. 3(6), 680–687 (2010). Serruys PW, Silber S, Garg S et al. Comparison of zotarolimus-eluting and everolimus-eluting coronary stents. N. Engl. J. Med. 363(2), 136–146 (2010). Kedhi E, Gomes M, Joesoef KS et al. Everolimus-eluting stents and paclitaxeleluting stents in patients presenting with myocardial infarction: insights from the two-year results of the COMPARE prospective randomised controlled trial. EuroIntervention 7(12), 1376–1385 (2012). Sabate M. The examination (a clinical evaluation of Xience-V stent in acute myocardial INfArction) trial. Presented at: European Society of Cardiology Congress. Paris, France, 27–31 August 2011. ▪ Examination trial including a multicenter all-comer design with 70% of the total number of ST elevation myocardial infarction cases to improve generalizability of results. Hofma SH, Brouwer J, Velders MA et al. Second-generation everolimus-eluting stents versus first-generation sirolimus-eluting stents in acute myocardial infarction: 1-year results of the randomized XAMI (XienceV Stent vs. Cypher Stent in primary PCI for acute myocardial infarction) Trial. J. Am. Coll. Cardiol. 60(5), 381–387 (2012). Nakazawa G, Ladich E, Finn AV, Virmani R. Pathophysiology of vascular healing and stent mediated arterial injury. EuroIntervention 4(Suppl. C), C7–C10 (2008). Nakazawa G, Otsuka F, Nakano M et al. The pathology of neoatherosclerosis in human coronary implants bare-metal and drugeluting stents. J. Am. Coll. Cardiol. 57(11), 1314–1322 (2011). Ahmed TA, Bergheanu SC, Stijnen T, Plevier JW, Quax PH, Jukema JW. Clinical performance of drug-eluting stents with biodegradable polymeric coating: a meta-analysis and systematic review. EuroIntervention 7(4), 505–516 (2011). Stefanini GG, Kalesan B, Serruys PW et al. Long-term clinical outcomes of biodegradable polymer biolimus-eluting stents versus durable polymer sirolimus-eluting stents in patients with coronary artery disease (Leaders), 4 year follow-up of a randomised non-inferiority trial. Lancet 378(9807), 1940–1948 (2011). Stefanini GG, Byrne R, Serruys P et al. Longterm outcomes of biodegradable polymer drug-eluting stents versus durable polymer sirolimus-eluting stents in patients with acute myocardial infarction: a pooled analysis of individual patient data from the ISAR-TEST 4 and LEADERS randomised trials. J. Am. Coll. Cardiol. 59(13 Suppl. S), E47 (2012). Räber L, Kelbaek H, Ostoijc M et al. Effect of biolimus-eluting stents with biodegradable polymer vs bare-metal stents on cardiovascular events among patients with acute myocardial infarction: the comfortable ami randomized trial. JAMA 308(8), 777–787 (2012). ▪▪ Key trial showing significantly increased efficacy and safety of biodegradable stents versus bare-metal stents in patients undergoing primary percutaneous coronary intervention. Brodie B, Pokharel Y, Fleishman N et al. 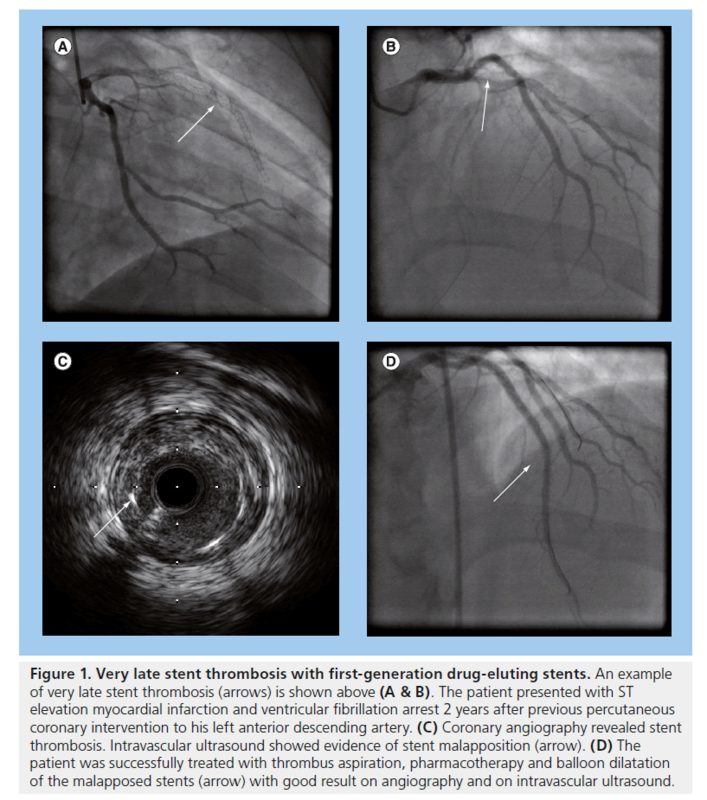 Very late stent thrombosis after primary percutaneous coronary intervention with bare-metal and drug-eluting stents for STsegment elevation myocardial infarction: a 15‑year single-center experience. JACC Cardiovasc. Interv. 4(1), 30–38 (2011). Kukreja N, Onuma Y, Garcia-Garcia H, Daemen J, van Domburg R, Serruys PW. Primary percutaneous coronary intervention for acute myocardial infarction: long-term outcome after bare metal and drug-eluting stent implantation. Circ. Cardiovasc. Interv. 1(2), 103–110 (2008). Park DW, Park SW, Park KH et al. Frequency of and risk factors for stent thrombosis after drug-eluting stent implantation during longterm follow-up. Am. J. Cardiol. 98(3), 352–356 (2006). Buonamici P, Marcucci R, Migliorini A et al. Impact of platelet reactivity after clopidogrel administration on drug-eluting stent thrombosis. J. Am. Coll. Cardiol. 49(24), 2312–2317 (2007). Dangas GD, Caixeta A, Mehran R et al. Frequency and predictors of stent thrombosis after percutaneous coronary intervention in acute myocardial infarction. Circulation 123(16), 1745–1756 (2011). Suh HS, Song HJ, Choi JE et al. Drug-eluting stents versus bare-metal stents in acute myocardial infarction: a systematic review and meta-analysis. Int. J. Technol. Assess. Health Care 27(1), 11–22 (2011). Nakazawa G, Finn AV, Joner M et al. Delayed arterial healing and increased late stent thrombosis at culprit sites after drug-eluting stent placement for acute myocardial infarction patients: an autopsy study. Circulation 118(11), 1138–1145 (2008). Cook S, Ladich E, Nakazawa G et al. Correlation of intravascular ultrasound findings with histopathological analysis of thrombus aspirates in patients with very late drug-eluting stent thrombosis. Circulation 120(5), 391–399 (2009). Finn AV, Nakazawa G, Joner M et al. Vascular responses to drug-eluting stents: importance of delayed healing. Arterioscl. Thromb. Vascu. Biol. 27(7), 1500–1510 (2007). Camenzind E, Wijns W, Mauri L et al. Rationale and design of the patient related outcomes with endeavor versus cypher stenting trial (PROTECT), randomized controlled trial comparing the incidence of stent thrombosis and clinical events after sirolimus or zotarolimus drug-eluting stent implantation. Am. Heart J. 158(6), 902–909.e5 (2009). Camenzind E, Wijns W, Mauri L et al. Stent thrombosis and major clinical events at 3 years after zotarolimus-eluting or sirolimuseluting coronary stent implantation: a randomised, multicenter, open-label, controlled trial. Lancet 380(9851), 1396–1405 (2012). Guo N, Maehara A, Mintz GS et al. Incidence, mechanisms, predictors, and clinical impact of acute and late stent malapposition after primary intervention in patients with acute myocardial infarction: an intravascular ultrasound substudy of the harmonizing outcomes with revascularization and stents in acute myocardial infarction (Horizons-AMI) trial. Circulation 122(11), 1077–1084 (2010). Guagliumi G, Costa MA, Sirbu V et al. Strut coverage and late malapposition with paclitaxel-eluting stents compared with baremetal stents in acute myocardial infarction: optical coherence tomography substudy of the harmonizing outcomes with revascularization and stents in acute myocardial infarction (Horizons-AMI) trial. Circulation 123(3), 274–281 (2011). Cook S, Wenaweser P, Togni M et al. Incomplete stent apposition and very late stent thrombosis after drug-eluting stent implantation. Circulation 115(18), 2426–2434 (2007). ▪ Study revealing late stent malapposition as a cause for very late stent thrombosis. Cook S, Eshtehardi P, Kalesan B et al. Impact of incomplete stent apposition on long-term clinical outcome after drug-eluting stent implantation. Eur. Heart J. 33(11), 1334–1343 (2012). Ahmed K, Jeong MH, Chakraborty R et al. Role of intravascular ultrasound in patients with acute myocardial infarction undergoing percutaneous coronary intervention. Am. J. Cardiol. 108(1), 8–14 (2011). ▪▪ Demonstrates no benefit of routine use of intravascular ultrasound for stenting during primary percutaneous coronary intervention. IJsselmuiden S. APPOSITION I & II one-year clinical results in STEMI. Presented at: Transcatheter Cardiovascular Therapeutics 2011. San Fransico, CA, USA, 7–11 November 2011. Meredith IT, Verheye S, Dubois CL et al. Primary endpoint results of the EVOLVE trial: a randomized evaluation of a novel bioabsorbable polymer-coated, everolimuseluting coronary stent. J. Am. Coll. Cardiol. 59(15), 1362–1370 (2012). Antman EM, Wiviott SD, Murphy SA et al. Early and late benefits of prasugrel in patients with acute coronary syndromes undergoing percutaneous coronary intervention: a TRITON-TIMI 38 (trial to assess improvement in therapeutic outcomes by optimizing platelet inhibition with prasugrelthrombolysis in myocardial infarction) analysis. J. Am. Coll. Cardiol. 51(21), 2028–2033 (2008). Capranzano P, Ferreiro JL, Angiolillo DJ. Prasugrel in acute coronary syndrome patients undergoing percutaneous coronary intervention. Expert Rev. Cardiovasc. Ther. 7(4), 361–369 (2009). Cannon CP, Harrington RA, James S et al. Comparison of ticagrelor with clopidogrel in patients with a planned invasive strategy for acute coronary syndromes (PLATO), a randomised double-blind study. Lancet 375(9711), 283–293 (2010).